Avs Lose 7-2; Granato Calling Out Players? When the score was 6-1, I started thinking to myself. "If this becomes the worst loss in Avs history, my blog might get some more hits tomorrow." It was not to be. The Avs lost 7-2 in a game that meant nothing to them. It should mean something to Tony Granato, who should, but won't be fired at the end of the season, but Tony, don't let me tell you what kind of emotion to show during a game. Granato did talk about Wojtek Wolski, though. Now, don't freak out if my hockey instincts are off, but isn't it up to the head coach and assistant coach(es) to develop young players and make sure they play consistent hockey? Jibbles has a chart that rivals those of James Mirtle. Even more important than the nhumbers, is that it's supposed to be the assistants job to build confidence in players and be the "good cop" to the head coaches "bad cop". Wolski, Svatos, Budaj, Liles and Hensick all seem to have had their confidence shattered at some point in the Granato era. Some of that is probably due to the overlapping of the Quenneville era, but it's Granato's job to build confidence too, and he's clearly failing in that regard. With eight or so games left in the season, Granato is talking about consistency on a team that has been consistently inconsistent. It's annoying. It's sickening. I'm fed up. But I'm a blogger in Philly. I don't pay to go to the games. The Pepsi Center looks empty, by the way. Lets hire some new coaches to make sure that the inconsistency is no longer consistent. The rest of the Avalanche season is marked by games against quality opponents except for one game: Colorado-Phoenix, April 1st. April Fools. The situation is an interesting one, and the game should be even more interesting. Here we have two teams - Phoenix and Colorado - who are battling for inferiority. By April 1st, it's very possible that both teams still have a chance at the second overall pick. Will both teams start their backups? Will both teams start calling up the entire farm? Will we see players scoring on their own nets and tripping the opposition like crazy to secure a power play? Maybe I'm going a little overboard, but the question remains: two teams with nothing to gain by winning. How do two teams, who might benefit more by losing, play each other in April? When teams find themselves in a position that makes the Playoffs seem like some far-away island, younger players are usually inserted into the lineup to gain some valuable NHL experience. Lets do it to the coach. Give Jacques Cloutier a shot. I want to see what he can do. -T.J Galiardi has been called up due to Paul Stastny's being injured. I've wanted to see what this kid could do since the Avs drafted him. Click here for some info about the newcomer. -Joe Sakic skated before the team practice this morning. Trying to get stronger for the 2009-10 season or gearing up for a final farewell? You be the judge. Well done, Marty. One more to break Roy's record. Avs won tonight, but Roy was in Montreal watching the man he beat in the 2001 Stanley Cup Finals tie his record for most regular season wins by a goaltender. That 2001 Cup reference really makes this season seem like a downer. 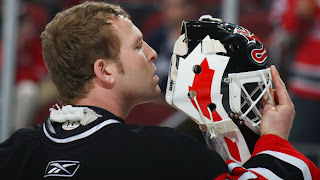 Brodeur goes for win #552 against the Blackhawks on Tuesday night in New Jersey. Try to watch it - this record isn't going to be broken for awhile. Watching the game last night, I finally realized the season was over. Of course, we all know that the Avs have effectively been out of it for a few weeks or so, but still, I can't ever remember watching an Avs game with less interest. Maybe it was because it was a Thrashers game. Maybe it was because the Thrashers actually got a shutout. Maybe it was because I was watching Matt Hendrick play against an ice hockey team from Atlanta. Here in Philly, it's 71 degrees and there's no Avs hockey. Welcome to 7 hours ago, GEO. The Avalanche shipped one of their defensive assets out of Colorado, moving defenceman Jordan Leopold to the Calgary Flames in exchange for defenceman Lawrence Nycholat, a second-round draft pick, that originally belonged to the Montreal Canadiens as part of the Alex Tanguay trade, and defence prospect Ryan Wilson. Farewell to Leopold who did, well, nothing in his time here. This was the first season he was really healthy so I guess it's lucky we got a second rounder for him. With guys like Shattenkirk, Cumiskey, Gaunce, and Williams in the system, I only wish Brett Clark was going with him. -Don't you wish we could have been part of that Columbus-Ottawa deal? -Kyle McLaren is still in the NHL? I won't be here until about 3 which is when trading closes for the season. Word around the web is that Leopold and Svatos may not be Avs for tomorrow night's game. We shall see. Why in the world is this game on Versus? Nothing people like seeing more than two 15th place teams being featured on one of the only channels on the planet that wanted to show hockey. So far, the featured players for the game have been Bill Guerin, Josh Bailey, and Ian Laperriere. Oh boy. Are we in for a treat.